Our On30 ready-to-run locomotives use Bachmann HO or On30 chassis. Prices shown in US $ unless otherwise stated. Click on any of the images below to display a full-screen (i.e.640 pixel wide) version. Remember, all of our RTR kits are strictly limited editions, so order early to avoid disappointment! We have imported a VERY short run of 10 x RTR K1 Garratt's in 7mm/ft O-scale narrow gauge. One, which was to a customer's special order and is pre-reserved, is for 14mm gauge, while the remaining nine are for 16.5mm gauge O-16.5. (same gauge as On30). Five of the ten RTR K1s are spoken for - which means five are for sale. These are never to be repeated imported brass models. Here's your only chance to purchase a RTR K1 before they're gone for good. These RTR K1 models have been solder-assembled at the same China factory who did our run of 65 x RTR NGG 16 Garratts a couple of years ago. Like the NGG 16s, they are all-brass. The whitemetal castings included in our K1 kit have been substituted with brass investment castings. The models are supplied factory painted in black livery with red end beams and counter-weights as shown in the accompanying photos. As per some customer's requests, we are currently arranging for fully lined WHR livery to be professionally. Naturally this professional lining service is available at extra cost. Some of the K1 models are currently being lined and as soon as we receive them, we'll post photos of a finished K1 in lined WHR livery. Each 0-4-0 engine unit in these K1 models is powered by a top quality Faulhaber 2020C coreless gearhead motor with an internal gear ratio of 49:1. The motor drives one axle in each engine unit via GrandtLine 1:1 bevel gears. Power to the other axle is via the coupling rods. As should be expected, performance is smooth and quiet down to a crawl. Naturally we are able to quote for the supply and installation of on-board DCC/sound. Our demo model is currently being fitted with a ZIMO MX640 sound decoder which has correct compound steam sounds downloaded onto it. Hopefully, this model will be available for inspection at EXPO NARROW GAUGE at Swanley on Oct 30th, RAIL EXPO in Paris on Nov. 12-14 or at the Warley Show at the Birmingham NEC on Nov. 20-21. Anyone seriously interested in obtaining one of these FIVE REMAINING RTR K1 MODELS is advised to contact us, where we will be happy to discuss your personal requirements. The picture shows the first completed ready-to-run On30 2-6-2T hot off the China production line. Deliveries have commenced on the NEW RTR On30 Saddletank projects. The 0-6-0Ts have started shipping - on a first come, first served basis - and we now expect the 2-6-0Ts will follow straight on from these. 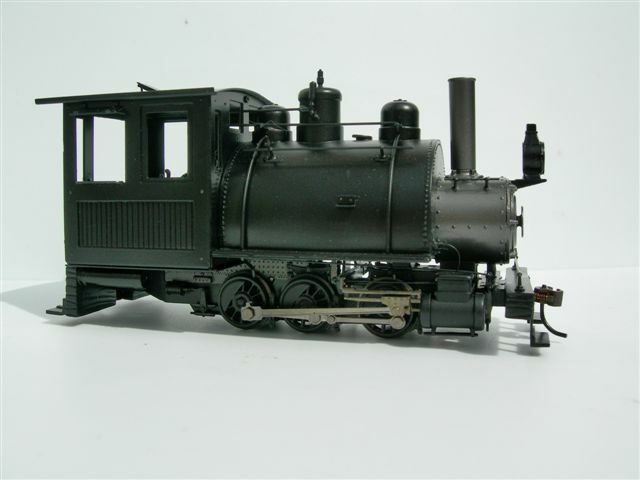 Because of the very limited quantities involved, we are still advising clients to reserve the 0-6-0 and 2-6-0 models with US$50 to be sure of obtaining one. We have been accepting reservations for a while on these saddletankers and there are now few remaining. DO NOT MISS OUT! As these new pictures show, the models turned out really nice. We'd say the finish was even superior to that of our earlier 2-6-2T project. These new 0-6-0 and 2-6-0 Saddletanks are supplied with both straight and woodburner stacks included. The stacks are painted but un-fitted. You choose to install your favourite option.As with our earlier RTR project, these models are again imported directly into the US from China. We have good friends in Virginia who handle final shipping to US clients on our behalf. Orders destined outside the US will be subject to an appropriate shipping charge and may be liable to applicable VAT and/or import duties. 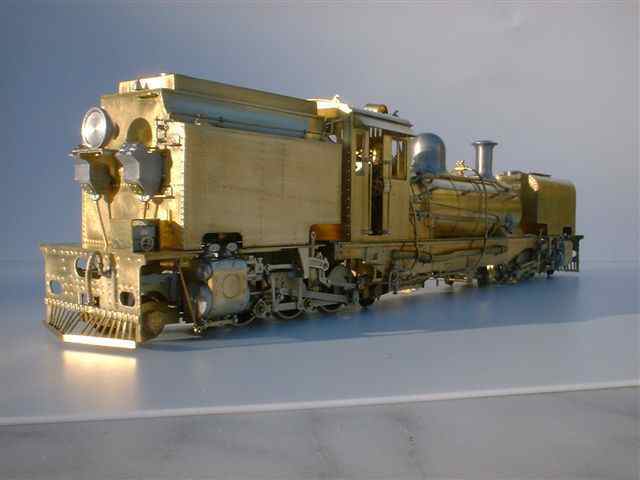 Prices are, once more, unbelievably cheap for an all brass, hand built, factory painted, imported Far Eastern model. The 0-6-0ST is US$260 and the 2-6-0ST will cost $275. Within the US there will be a uniform $10 shipping/handling charge. Models destined overseas will be shipped via airmail at cost. We know for sure that a lot of modellers procrastinated and missed out on our earlier RTR On30 2-6-2T which has long-since sold out. It's not like we didn't tell guys in our advertising that this would happen at the kind of price they were offered at. Likely as not, same thing will happen with these new little saddletankers. Want one? Take our advice and get on the list to be sure. The China factory are also working on the pilot models for the 2-6-2+2-6-2 NGG 16 Garratt loco. These magnificent models will be available for 16.5mm gauge (On30 and O-16.5) and will be supplied factory painted. Power is via a pair of Swiss-made Faulhaber coreless gearhead motors. Performance will, of course, be exemplary. Very limited quantities are being manufactured (as few as 35-50 units) so these will certainly be exclusive models. We began accepting pre-reservations for these beauties a couple of months ago and we will be delighted to add your name to the growing list if you are serious about securing one of these incredible pieces of motive power.